There are lies and lies,” mumbles Baines, butler to the French Ambassador, to his severe, sadistic wife, “and some lies are just kindness.” The shifting importance of truth is the subject of Reed’s incredible domestic thriller, a theme with which the characters seem to have a desperate, frightful relationship. A year before he directed The Third Man, Reed took his fluid, uniquely perceptive camera into the home. Felipe, the inquisitive 10 year-old son of the ambassador, is left alone for the weekend with Baines, with whom he enjoys a scampish relationship, and Mrs Baines, a cold-hearted, sexless matron. Felipe slips out to discover Baines pleading with his mistress in a local tea shop. Baines asks for Felipe to keep this a secret, which he does, unsuccessfully, letting it slip to Mrs Baines later on. This becomes the first confusion for Felipe: When is it acceptable to bend the truth? Mrs Baines contrives a trip to her sick aunt. However, she remains in the embassy, to confront Baines, who has arranged to have dinner that evening with Julie, his mistress. The two are genuinely in love, but Baines, a kindly man, fears his wife. At a moment of incredible tension, Mrs Baines beats Felipe, after he fails to keep her secret that she is hiding in the basement. Baines comes to the boy’s rescue and the husband and wife argue at the top of an ominous marble staircase. Felipe observes the argument from the fire escape. As the husband and wife descend inside, Felipe must hop down to the next window. By the time he reaches it, Mrs Baines lies at the foot of the staircase with a broken neck and Baines, his friend and father figure, stands over her fearfully. The audience is aware of Baines’s innocence, as we “witness” her independent, accidental fall. However, in the eyes of the young boy, Baines is a murderer whom he is desperate to save. The beautifully pitched arc of the film has Felipe—having had his notion of truth obscured by deceitful adults—resolve to “lie” to the police and protect Baines, who, of course, is perfectly without guilt. The benevolent lies of the boy incriminate Baines, who entraps himself in a tangle of lies and inconsistency in an attempt to present an acceptably “true” story to the police. 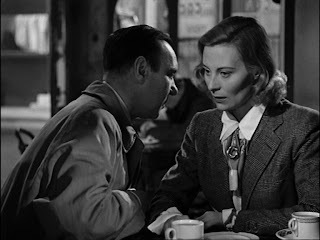 Graham Greene’s screenplay is perfectly judged, enticingly paced. This is a fine example of what British cinema could do at its heights. Like Powell and Pressburger or Hitchcock, Reed was an idiosyncratic craftsman whose presence could be felt in every thought-out frame. The economy of meaning for which Hollywood is rightly celebrated was natural to Reed, keeping the audience alert in the knowledge that everything on screen has a purpose. This is a mesmerizing thing, no doubt providing the world of fiction, and each significant moment within, a sense of meaningful destiny, which can be lost in the lives of real people. Reed’s film never veers into fantasy; the warmth with which he treats the subject is, at once, thrilling, funny, and moving. The decline of British Cinema is no doubt due to the seeming unwillingness to persevere with such well-rounded films, moving away from the simple idea of entertainment into whatever it is now. There are some beautifully poignant moments in the film, one particular example being the scene in the teashop where Felipe discovers Baines. The butler continues his conversation with Julie, now referring to Julie as “your friend.” He pleads with Julie to talk to this “friend,” so sure that “her chap” begs her to stay, rather than move back to France. It’s excruciating to watch Baines, so desperate to unleash his passion for her, filter his emotions through yet another screen. Later in the film, another effective moment sees Baines and Julie playing hide and seek with Felipe, almost discovering Mrs Baines, who hides in the house, herself seeking revelation, truth. One suspects that it remains far too contorted, twisted, and unrecognisable to ever be uncovered. The final moments involve Felipe apologising to Baines, not for telling the truth, but for lying ineffectively. He is confused, telling Baines that he thought God took care of such things. “Trouble is,” replies his doomed friend, “we’ve got a hand in the game.” There are so many defining moments in this perfectly executed film, and this is one of them. The world—not just the playful world of Felipe—is about negotiating the rules of the game. Almost everyone here gets it wrong, making them fallible, pathetic, and, of course, much like the rest of us.